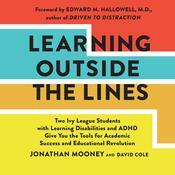 Written by two Ivy League graduates who struggled with learning disabilities and ADHD, Learning Outside the Lines teaches students how to take control of their education and find true success with brilliant and easy study suggestions and tips.Every day, your school, your teachers, and even your peers draw lines to measure and standardize intelligence. They decide what criteria make one person smart and another person stupid. They decide who will succeed and who will just get by. Perhaps you find yourself outside the norm, because you learn differently—but, unlike your classmates, you have no system in place that consistently supports your ability and desire to learn. Simply put, you are considered lazy and stupid. You are expected to fail. Learning Outside the Lines is written by two such “academic failures”—that is, two academic failures who graduated from Brown University at the top of their class. Jonathan Mooney and David Cole teach you how to take control of your education and find true success—and they offer all the reasons why you should persevere. Witty, bold, and disarmingly honest, Learning Outside the Lines takes you on a journey toward personal empowerment and profound educational change, proving once again that rules sometimes need to be broken. Written by two Ivy League graduates who struggled with learning disabilities and ADHD, Learning Outside the Lines teaches students how to take control of their education and find true success with brilliant and easy study suggestions and tips. Every day, your school, your teachers, and even your peers draw lines to measure and standardize intelligence. They decide what criteria make one person smart and another person stupid. They decide who will succeed and who will just get by. Perhaps you find yourself outside the norm, because you learn differently—but, unlike your classmates, you have no system in place that consistently supports your ability and desire to learn. Simply put, you are considered lazy and stupid. You are expected to fail. Learning Outside the Lines is written by two such “academic failures”—that is, two academic failures who graduated from Brown University at the top of their class. 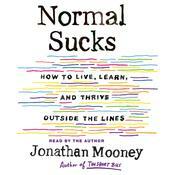 Jonathan Mooney and David Cole teach you how to take control of your education and find true success—and they offer all the reasons why you should persevere. Witty, bold, and disarmingly honest, Learning Outside the Lines takes you on a journey toward personal empowerment and profound educational change, proving once again that rules sometimes need to be broken. 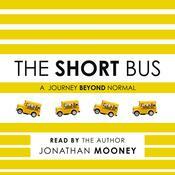 Jonathan Mooney, the author of several books, is a dyslexic student who did not learn to read until he was twelve years old. After attending Loyola Marymount University for one year, he transferred to Brown University, where he graduated with an honors degree in English. He is the recipient of the distinguished Truman Fellowship for graduate study in the field of learning disabilities and special education. His work has been featured inthe New York Times, Los Angeles Times, Chicago Tribune, USA Today, HBO, NPR, ABC News, New York Magazine, Washington Post, and the Boston Globe. He continues to speak across the nation about neurological and physical diversity, inspiring those who live with differences and advocating for change.